A major shift in world financial power centers is on the horizon. America is on the decline, while Asia and Europe are on the rise. America would decline as a financial power. Just five years ago it would have been hard to imagine an official representative of the German government making such statements in a speech outlining his government's position in Germany's parliament, the Bundestag. At the end of September German finance minister Peer Steinbrück sketched his view of the world financial crisis. For Steinbrück one thing is absolutely clear: "The United States is the place of origin and the focal point of the crisis." Although the long term effects of the crisis are as yet undetermined, Germany's finance minister prophesied that America "will lose its status as [the] superpower of the world's financial systems." • The U.S. Department of the Treasury nationalized mortgage lenders Fannie Mae und Freddie Mac. • The investment bank Lehman Brothers declared bankruptcy, making it the largest insolvency in American history with a 600 billion dollar loss. Several German institutions had holding in Lehman Brothers, including the Postbank, various national health insurance carriers and even the German national social security system. • The investment banks Goldman Sachs und Morgan Stanley applied to operate as commercial banks to gain access to the FDIC for securing investor deposits. In so doing, both banks voluntarily accepted regulation by the Federal Reserve Bank. • The U.S. Congress approved an emergency aid package worth 700 billion dollars. 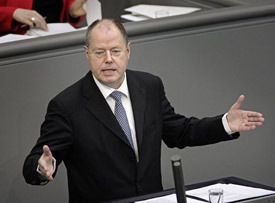 According to Steinbrück, the financial malaise in the U.S. has "spread like a poisonous oil spill." The European Union and several Western countries have adopted their own emergency measures to cope with the crisis. The Bundestag passed emergency legislation authorizing the established of an emergency fund for German banks that is proportionally even larger than the America's 700 billion dollar plan. One result of the worldwide financial crisis is already foreseeable: "The world will not be the same again as it was before this crisis," was Steinbrück's prediction. The EU and the Asia are pushing for new regulations to oversee the world's financial markets. President Bush, though, wants financial markets to remain free and open, with the markets "regulating" themselves. But that is exactly what did not work in the development of the current crisis, according to former U.S. Federal Reserve chairman Alan Greenspan's testimony at a Congressional hearing just days ago. For 40 years Greenspan has championed unregulated capital markets. "I made a mistake," Greenspan said, "in presuming that the self-interest of organizations, specifically banks and (other financial institutions), were such as that they were best capable of protecting their own shareholders and their equity in the firms." Greenspan did not account for human nature's ability to make use of an opportunity for personal enrichment at the expense of others. "Love of money" is one of the characteristics of those perilous times to arise in the last days, according the apostle Paul (2 Timothy 3:1-2). Even without the current crisis, though, the U.S. position as the world's financial leader has been threatened by America's risky financial policies. With the turbulence on world financial markets, "small" investors are understandably concerned about the safety of their deposits and investments. However, the current situation is more than just a financial crisis. It signals an impending irrevocable shift in global power. The age of America's dominance as the world's financial superpower is coming to an end. America's standing in the world community had already suffered damage because of the Iraq war, but the damage from the current crisis will be irreversible. Government intervention in the U.S. economy and the nationalization of financial institutions defies the principle of free capitalist markets. America's underpinning economic philosophy is being shown to be flawed, just as the Soviet system eventually revealed its inherent weaknesses. The American system operates on the premise that capital markets will be self-regulating to everyone's benefit, assuming that human nature under Satan's influence is good. The result of this false premise – as the current financial crisis clearly demonstrates – is a "predatory capitalism" where quick profits are sought using greed techniques like short-selling, leveraged buy-outs, speculative hedge funds, etc., that provide no real economic value. For years American administrations seemed to be schoolmasters, lecturing other countries on the virtues of sound financial planning, budget deficits and related issues. American influence within the International Monetary Fund was the reason why countries like Argentina, Indonesia and Thailand went into recession when their governments were forced to cut government spending in exchange for funding via the IMF. However, the United States did not practice what it was preaching. Tax cuts for American taxpayers and the burden of expanded military obligations have led to an unprecedented increase in the federal budget deficit. At the end of September the U.S. national debt exceed 10 trillion dollars for the first time in history. If the as yet unfunded future obligations of America's social security system are factored in, the national debt actually amounts to some 60 trillion dollars. In the past, concerns over America's growing national debt were countered by the argument that the creditors were largely Americans themselves, who bought U.S. treasury bills. Today, however, 25 percent of America's annual federal budget deficit is paid for by foreign purchases of treasury bills. The percentage has doubled in just the last 20 years and will continue to increase. Why? The average savings rate of the American public – the percentage of disposable income set aside in savings – is at an all-time low and is actually negative at about 2 percent. That means that the average American is actually spending more money each year than he has available to spend. By contrast, the savings rate in Germany is at a postwar record level at 11.2 percent. America's emergency aid package will lead to more deficit spending, which is being financed increasingly by foreign nations like China. Oddly enough, China has been one of the countries lectured in the past by Washington on sound fiscal policy. Today there don't appear to be any Chinese banks on the verge of bankruptcy. Will China and other nations that have been major purchases of U.S. Treasury securities in recent years – countries like Russia and the petrodollar nations lining the Persian Gulf – continue to support the dollar as the world's leading currency? Or will the current crisis be the impetus that sees a shift away from the dollar? Whatever the answer is, the United States won't be determining the outcome on its own. The current financial mess can only be solved via cooperation among the affected regions of the world. The U.S. economy is not about to collapse. It will remain the world's largest economy for the time being. However, the demise of former world empires was often tied to the adverse effects of financing military expenditures, with one adverse effect being a rise in national debt. For example, the British Empire began to buckle under the weight of its colonial obligations in the 19th century, and expenditures for World War I pushed Britain further down the road to losing its position as the world's financial center. One of the reasons for the collapse of the Soviet system was the failure of its economy, which was strained by the war in Afghanistan and the attempt to keep up with the U.S. in the arms race. It won't be any different for America when it comes to the impact of military costs and deficit spending. In the five years since the U.S. invaded Iraq, the national debt has grown by 500 billion dollars annually. This trend would have threatened America's position as the world's primary financial center even without the current crisis. The publicly held portion of the national debt now equals about 37 percent of the U.S. Gross Domestic Product. When that portion of the national debt held by U.S. governmental agencies is factored in, the percentage rises to 65 percent. That is twice as high as at the end of World War II, which was the most expensive war in U.S. history. By contrast, the current ratio of national debt to GDP for China is only about 19 percent. If current trends continue and legislated increases in U.S. entitlement programs and deficit spending for unfunded Social Security obligations are factored in, then America's national debt will be well over twice the country's annual GDP by the year 2040. "Who will want to lend us money then?" asks financial expert David Walker. Proverbs 22:7 reveals an interesting principle that this development will have on America's status as a world leader: "The rich rule over the poor, and the borrower is servant to the lender." Most Christians do not realize that America's greatness as a nation – and her impending decline – were prophesied in the Bible. America's real heritage can be traced back to the ancient nation of Israel, comprised of the twelve tribes of Israel. One of the blessings promised Israel for its faithfulness to God was it solid financial standing among the community of nations: "You shall lend to many nations, but you shall not borrow. And the Lord will make you the head and not the tail; you shall be above only, and not be beneath" (Deuteronomy 28:12-13). Conversely, Israel was prophesied to become a debtor nation if it chose to disobey God (verse 44). Bible prophecy indicates a shift in the balance of power among the world's major regions for the period preceding Jesus' return. The main focal point of that development will be the continued decline of the English speaking peoples that descended from their British homeland, including the United States. That's the real story behind the current financial crisis and the impact it will have on the future of the United States. You can find more information on America's unknown heritage by reading the free booklet The United States and Britain in Bible Prophecy.